The comments on a WordPress blog are usually the focus of a site. Often, the remarks left by others on an article are more interesting than the post itself! However, there are many situations when you may want to remove WordPress comments or disable the comments entirely throughout the blog. 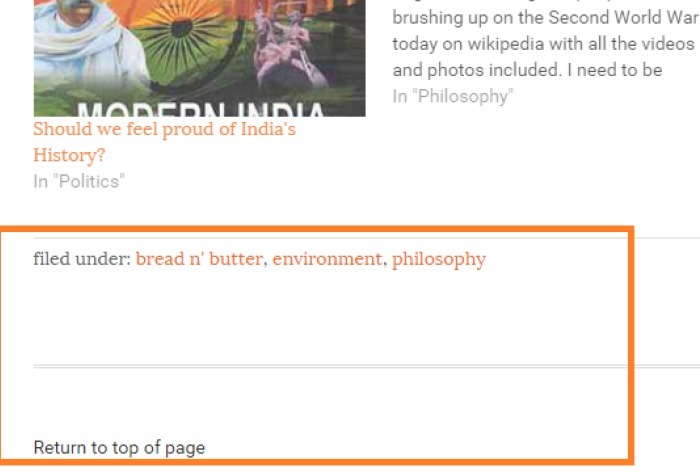 Either you’ve determined that the comments are not adding any additional value (as some science-based sites have found), or you’re using WordPress not as a blog but as a site builder. Perhaps you wish to generate only press releases or some other content on which it doesn’t make sense to have comments. For such situations, turning off comments not only makes sense, it also reduces the load on your website by eliminating all comment spammers. There are many ways to disable WordPress comments – you can use a plug-in, remove the comment section on a post by post basis by clicking the check box underneath every post’s editing screen, or by modifying the comments template for the theme. Unfortunately, the first option requires you to add a permanent burden on your site by installing a plug-in. The second is not scalable for a large number of posts especially if you have a lot of backlog, and the third may be difficult to implement depending on the kind of theme you have. 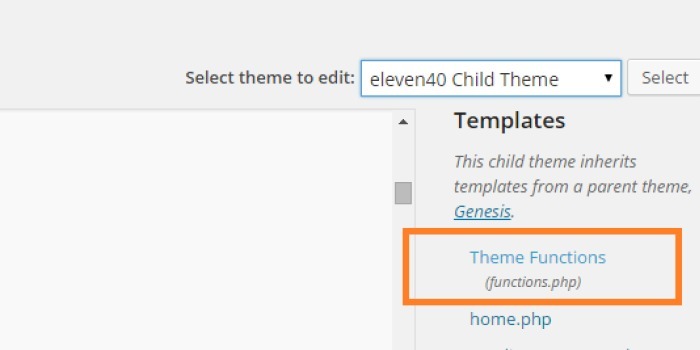 Recently, many WordPress frameworks hide a lot of the internal workings of their themes making it nontrivial to find the appropriate theme file. However using one particular WordPress filter, we can implement a scalable solution for disabling comments on your WordPress site completely in a theme independent manner. 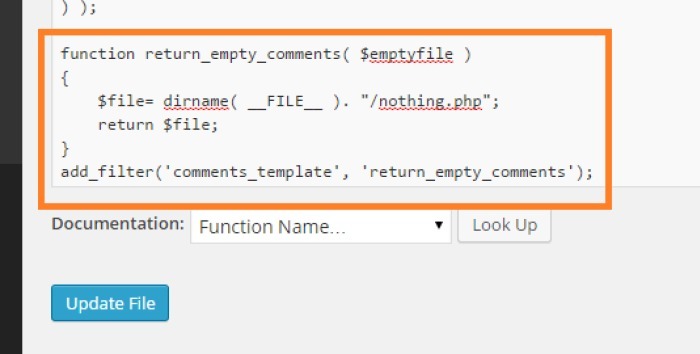 What this does is it creates a custom function to hook into the “comments_template” filter and simply returns the empty file we created in the first step. Note the “dirname()” function which returns the current path for the script, which is why it’s so important to place our nothing.php file into the correct subdirectory. Save your functions.PHP file, locate any WordPress post or page containing a comments section and loaded up in your browser. Here is a before and after comparison of the comments section on my test blog. Note that this code in functions.php has to be copied over to every new theme that you implement. Each of them will have a functions.php file within their own sub directory so it’s not going to be very difficult to transfer it. If you want a more scalable solution, you can even create your own plug-in containing theme independent external code so that you don’t have to perform any additional migrations when switching themes. But that’s beyond the scope of this article. 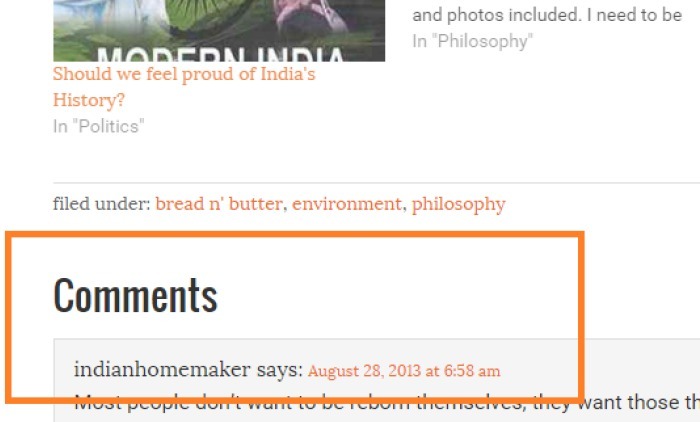 This elegant technique can be further tweaked to only remove comments from posts, pages, or from those articles which don’t have existing comments on them. The latter option is useful if you want to retain all previous user generated content when you are creating a website. Nick Anderson owns and operates www.dailyhosting.net which provides WordPress Web hosting products and add on’s.